1887 Oscar Jespers was born on the 22nd of May in Berchem-Antwerp, he was born as the son of the sculptor Emile Jespers. 1900 Oscar visits the Koninklijke Academie in Antwerp. 1908 Attends a sculpture course there until 1911. 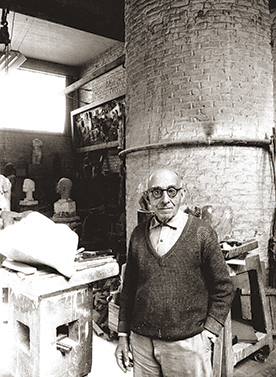 1912 Acquires his own studio in Antwerp. 1914 Around the 28th of September many residents flee the city of Antwerp, including the Jespers family, to escape from German missile raids. On the 9th of October the city falls. – A friendship begins between Oscar and the poet and art theorist Paul van Ostaijen (*1896) and the painter Floris Jespers, Oscar’s younger brother. 1916 On the 1st of April, Jespers marries Mia Carpentier, who would lovingly support her husband throughout their lives together. Paul Ostaijen published his first article on the work of Oscar Jespers. 1920 In November, December and the beginning of 1921 an intensive collaboration with Paul van Ostaijen produces one of the only Dadaist poetry collections from this Dutch speaking region: Bezette Stad. Paul van Ostaijen, who had been living in Berlin since the end of October 1918, expresses herein the fear felt by the inhabitants of Antwerp for their aggressor. The typography is experimental and expressive. Oscar Jespers designed and realised the Cubist experimental illustrations. – Jespers exhibits at Sélection in Antwerp. At a later date he befriends the two founders of Sélection: Paul-Gustave van Hecke and André de Ridder. 1921 In April Bezette Stad was published. – Oscar Jespers exhibits eleven artworks at Kunst van Heden in Antwerp and continues to exhibit here often, sometimes even annually. – The piece called De Pottendraaier made with stone from Euville (a limestone variety from Euville), heralds a new development within the form of Cubism. 1922 Birth of his daughter, Hella. – First major contract from the government: an artwork for the Koloniaal Museum in Tervuren. 1924 Between 1924 until 1930, Oscar Jespers carves from stone about twenty extremely expressive heads, and a few nudes: consequently achieving a very personal form of Cubism. 1925 Jespers exhibits 21 pieces of art at Le Centaure in Brussels. Within the context of Le Centaure, a friendship grows between Gust De Smet, Constant Permeke and Frits van den Berghe. 1927 By recommendation from the director Henry van de Velde, Jespers is appointed to teach the decorative monument and sculpture course at the Visual Arts school of higher education, La Cambre in Brussels. Consequently Oscar moves to Brussels with his wife and daughter. On December 14th, his only child unexpectedly dies. 1928 On March the 18th, Paul van Ostaijen dies from tuberculosis – Oscar Jespers exhibits for the first time in Paris. 1929 Victor Bourgeois, along with Oscar and Mia Jespers, design a house to fully accommodate a sculptor. Erfprinslaan 149, Brussels: a family home containing an art workshop and two exhibition rooms. – Birth of their only son, Paul. – The art market shrinks as a result of an international recession. Over the next few years several acclaimed art collections are auctioned. 1934 Jespers exhibits predominantly his most recent artworks at Kunst van Heden in Antwerp, displaying 34 Expressionist pieces in stone. The exhibition is a huge success. 1938 The Picasso expert Alfred H. Barr, who lives in New York, discovers the work of Oscar Jespers at an exhibition in Brussels where 10 pieces were on display. Barr buys De Bekoring van Sint Antonius (The Temptation of Saint Anthony) for the Museum of Modern Art in New York. 1949 Jespers starts to teach sculpture classes at De Jan van Eyckacademie in Maastricht, where he already teaches drawing. 1952 From this year onwards he participates in every art biennial in Park Sonsbeek in Arnhem and in Middelheim in Antwerp, where high profile outdoor art exhibitions are held. 1960 Oscar Jespers exhibits 41 artworks at the 30th Venice Biennale. 1964 In Utrecht and Nijmegen, Den Bosch and Heerlen, vast retrospective exhibitions are organised displaying his sculptures and drawings. – Mia Jespers-Carpentier dies on the 8th of July. 1966 Het Museum van Elsene/Ixelles in Brussels presents the most extensive retrospective exhibition of Jespers’ artwork that had ever been held, displaying 75 sculptures and around 35 drawings 1968 De beeldhouwer wordt getroffen door een beroerte; hierna zal hij niet meer werken. 1968 The sculptor suffers a stroke, after which he no longer works. 1970 On the 1st of December the artist dies at his home in Brussels.